Life can be complicated. Getting help shouldn't be. • Call or message a U.S.-based support expert! 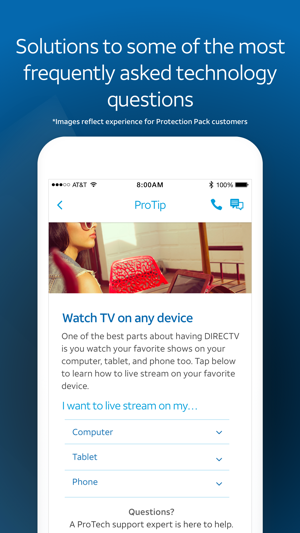 • Browse tips customized for your device! Help and support for your technology is just a tap away! 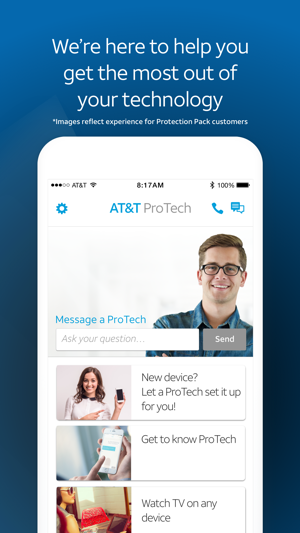 Enjoy the premium services that come with an AT&T Mobile Protection Pack or AT&T Multi-Device Protection Pack! Enjoy unlimited access to our team of trained support experts! 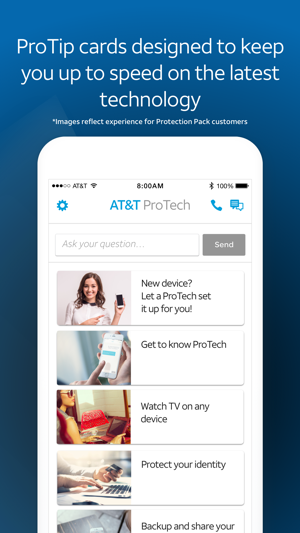 With AT&T ProTech, the answers to your technological headaches are right in your pocket. Let us help you set up your phone. We can get you connected with your Wi-Fi, Bluetooth, apps, speakers, smart devices, car, and more! Free up your phone's memory with easy access to AT&T Photo Storage! Let us seamlessly back up your phone's photos and videos. To give you the best help possible, a ProTech support expert may ask to view your screen. Depending on your device, we may need to request administrator access to provide remote support. This access will only happen with your permission and will be disabled when the remote session ends. For continuous improvement of the ProTech app, real-time user analytics and crash reports may be collected. Reach out to a ProTech expert today. We are here to help! I simply went in for a battery, I had a over five year old phone that worked great. But I all thing it started to wear down. Now once in the store I was greeted by Chris. We got to talking and he started telling me about the technical issues on the old I Phones. Well as a result of his knowledge that made sense to me and this man even suggested that I could get a battery at a non affiliated store. The more knowledge I was gaining, the more I was able to see a clearer path to make a truer more informed decision. Of course we also enjoyed each other’s company from the laughing and joking around that we almost missed a Doctor’s appointment. I like people like that. Well to make a long story short ( LOL ) I walked out of there with the latest and greatest phone on the market today. This was because of Chris’s knowledge and above all his honesty to me. The integrity was tremendous. I have been with ATT since they were first SouthWestern Bell. I have never Changed. Now if your in the Tyler, Texas area on Hwy 69 south and need some good honest friends to help you out. Look up Chris, He will go above and beyond. He has a communication’s degree from college, he should be in radio or TV. ATT IS REALLY GETTING THERE MONEY WORTH OUT OF CHRIS. Well check them out. You will not be disappointed. They are just down home real folks . PRO-TECH, this review is for the TEAM! I’ve been a loyal client of AT&T for over a decade and in the beginning my relationship w AT&T was like any relationship, it was based on nurturing a good foundation of Trust and Partnership. Somewhere along the way that happened and everything was great and then it changed, severely, things went downhill, quickly, but since the inception of PRO-TECH, I couldn’t be happier, though it’s all part of AT&T, the way the agents from PRO-TECH treat their clients have been superior, even if my calls (emphasis on calls) the agents here are stellar, professional and more empathetic than any other departments with AT&T. During my recent ordeal an agent Delila promised to call me to check in, and even though my calls didn’t have anything to do with tech issues, she called me twice and left messages just to check in to see how I was doing w my issues and if there was anything her department can do. That is customer CARE, my EXPERIENCE w PRO-TEXH has been nothing but positive, if not for PRO-TECH I would’ve already been gone, THANK YOU to this amazing CORE group of amazing agents. 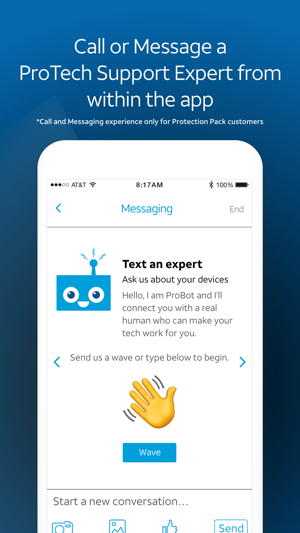 PRO-TECH, the rest of AT&T agents can take lessons, keep up the amazing job you do, even if the call have nothing to do w tech, you were there for me, listening and being empathetic is key to great customer care! KUDOS! Pro tech is awesome. I am new to apple and have their app. They came highly recommended but with that said I was still Leary and skeptical about them being able to assist me. I have terrible issues with any electronic device and am technologically challenged. Not illiterate well maybe partially, but I tend to go round and round and can’t seem to recall or know what’s the best and easiest way to use my smartphone. Pro tech not only assisted in my moment of crisis and duress. They continued helping and gave me numbers and links for services and continuing support. Other support and help centers usually hang up on me, get mad because I didn’t understand, yelled and me said I take too long and waste their time. Pro tech were and continue to be very courteous, polite, and extremely knowledgeable and proficient. The are also patient and understanding and do not judge. Pro tech is truly there to help and do everything they can and don’t give up until you are satisfied. You are my tech hero’s!!! !